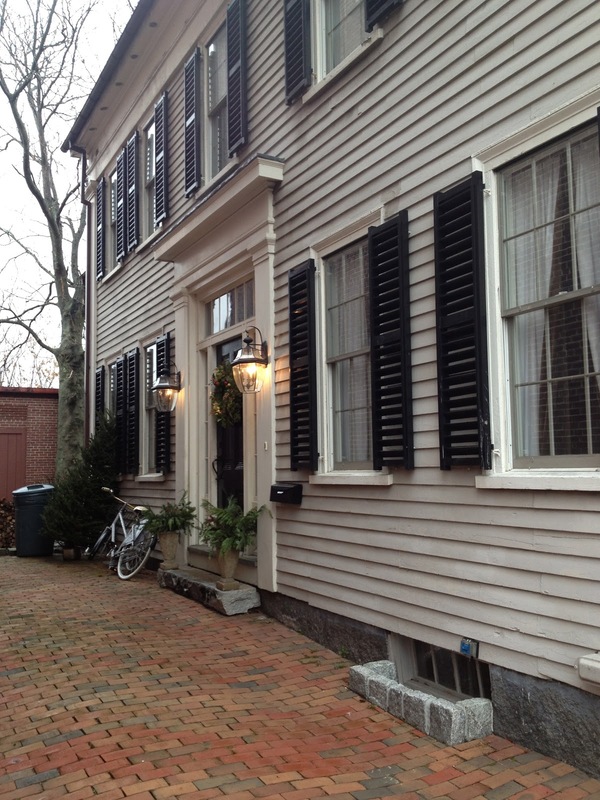 And so, here we have more beautiful houses from the Newburyport Holiday House tour. You can see Pt. 1 here. I shot the image above a few months ago because I love a big yellow Federal house. My condo in Nport was also in a yellow Federal, although it had seen many owners over it’s two centuries and had been an apartment building for many years, so it’s not quite as grandly maintained as this one. This house was built in 1795 and has had only four owners since – which is pretty amazing. The cupola and vestibule were Victorian era “improvements”. Given what they could have done to the place, these aren’t bad additions. The portico entry on tour day decked out for Christmas. They did the decorations in a Nutcracker theme. The dining room featured a beautiful metallic ceiling which looked gorgeous in the light of the chandelier. Obviously, this pic didn’t really capture it, but it was an unexpected bit of glamor. 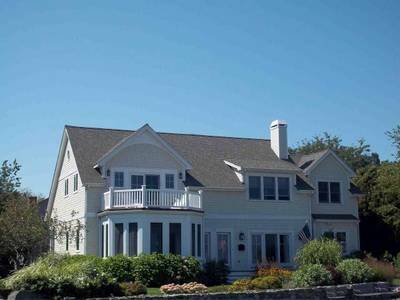 The next house (image above from online source) has spectacular views of the Merrimack River and Joppa Flats. Built in 2001, it’s got an open floor plan first floor that focuses on the amazing views. Looking from the kitchen into the family/sitting room. Love the furniture detailing on the cabinet base. They had a nice mix of rustic and bling in their holiday decorating. This “island” separated the kitchen and table from the sitting area nicely, while maintaining the open feel. The dark walls were painted Ben Moore’s Newburyport Blue, appropriately. Cozy on a cold New England day overlooking the water. A mediocre picture of a beautiful view. Loved the stair case that opened up onto the first floor. On the second floor there was a sweet little inlaw apartment that was actually quite spacious and featured a decent size, if utilitarian, kitchen. Part 3 of this series will have my favorite house, so stay tuned! But meanwhile I leave you with a couple of house shots, both gray, as it turns out.